And in that heavenly guise, Suzette Lawrence, who admits only she is “a woman of a certain age,” continues to light up stages, neon signs and marquees in Nashville, where she arrived in 1995, a bit naïve about Music Row reality and all but certain she’d be the star she never became. She had performed in Nashville with the rest of The Neon Angels, long before deciding to sink her roots here. “I was married to Chris (Lawrence), and we’d been playing a lot around here,” says this gentle woman who “feels like I’m 40” despite the disparity with the calendar age I promised not to reveal. “We’d been playing a lot at The Palomino (legendary City of the Angels haunt for roots music and much more),” so they were exposed to neon every time they joined the cowboy actors, country singers and rockabilly acts inside the landmark North Hollywood nightclub. Suzette also lived just one block off the Sunset Strip, so she and her friends basically inhaled neon as they negotiated their nightly lives most famously to The Palomino but also to whatever gin joint or beer-and-pickled, hard-boiled egg purveyor that had a spotlight. They tried on the moniker Neon Angels, and it stuck. “It’s really weird. So long ago. I can’t remember who came up with the name Neon Angels,” but it was about the time (1992) she and her outfit recorded “He’s Breaking My Heart” for the third installment in the “A Town South of Bakersfield” compilation. Billy Swan, Albert Lee, Dwight Yoakam, Dale Watson, Jim Lauderdale and Lucinda Williams were a few similarly bent cowboys and cowgirls who participated in the project. Suzette, her husband and band were fixtures of the Los Angeles honky-tonk and long-neck beer scene. The Flying Burrito Brothers, Linda Ronstadt, Emmylou Harris, Cash, Kristofferson, Waylon and Willie and the boys were just a few of their colleagues committing gritty, guitar-driven country-and-western music, she recalls. They’d scouted out that world during gigs there and were seduced by L.A.’s glitter, glamour … and neon. “When we got back in Austin, it was like ‘I want to go to L.A. I want to go to L.A.,’” she recalls, more or less quoting her comments to her then-husband. “So, we made the decision to move to L.A. It was so cosmopolitan. So many venues. So many musicians. “It’s about then that I met Billy Block” she says of the long friendship she struck with natural-born promoter and drum wizard Block, who was part of L.A.’s famous “Ronnie Mack’s Barn Dance.” Billy – a damn nice guy – later moved to Nashville and embraced L.A. refugees as well as Music City’s rootsy underground. Cancer claimed silver-haired Billy about three years ago, long after he launched his own version of the Barn Dance with his variously-dubbed “Western Beat” weekly roots showcase. “I thought we were going to be stars. I was really excited,” Suzette recounts. “We moved to Nashville and did a record demo for Polygram.” The Neon Angels, were counting on a CD from Polygram that would catapult them to stardom. And The Neon Angels were, for the moment at least, squashed. That failure to launch was one of the factors in the dissolution of Chris and Suzette’s marriage, she adds. They went back to Los Angeles, which was where Chris wanted to live, while Suzette pined for a chance to prove herself in Nashville. “I really love this town for the music’s sake,” Suzette says when asked why she uprooted her life to move here. Chris stayed in L.A. when Suzette “got in a very old car and drove by myself all the way across the desert. It was a Ford Crown Vic. 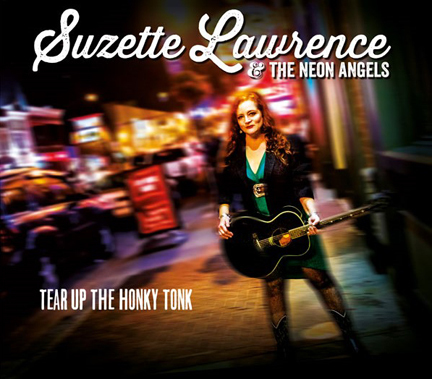 And she continued gigging as much as possible, either as a solo Neon Angel or – if she cobbled a band together from the thick ranks of the sidemen who fill Nashville studios – as Suzette and The Neon Angels. Nowadays, if she needs a couple of Angels, she’ll call on Kenny and Ruth Gunderson Griffin – her old band mates – for drumming and electric bass. Should be noted that Kenny and Ruth – who married after the original Neon Angels collaborations – also deserted Hollywood’s cement ponds and Klieg lights fantasy world to move to Nashville. Before I let her get too far from recounting her fear and loathing exodus across the desert to find musical salvation right here in Music City, I ask her about the old Crown Vic she had driven back then. 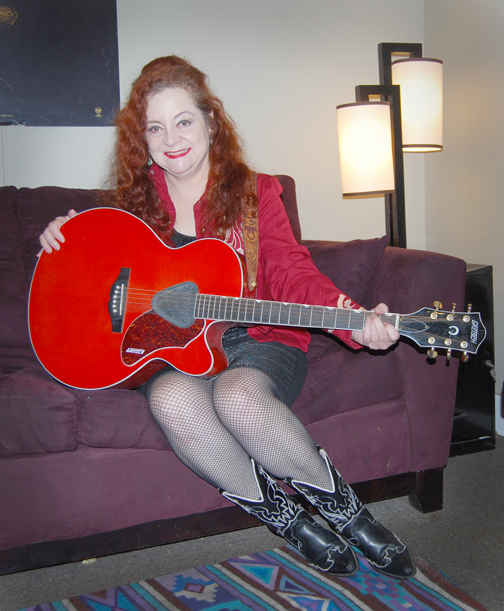 Suzette’s life in music began as a child raised in San Antonio. “And besides us, we usually had a five-string banjo picker and a Dobro player,” she notes. The Backwoods Volunteers bluegrass band stayed together for about 10 years – basically until her parents divorced – and “We’d travel to bluegrass festivals around the country. Even the Bill Monroe Bean Blossom Festival in Indiana,” where the Father of Bluegrass Music and creator of that high, lonesome sound had initiated the country’s oldest annual festival. “I never played with him (Monroe), but I sure listened to him play a lot,” she says. Suzette relished the years she spent with the family band, but notes her musical roots were planted much earlier in her life. “When I was 6 years old, I begged my mom to teach me how to play a guitar. I’m always trying to tell the story about this big, apricot tree that every spring would blossom. Her mother also helped the family’s repertoire flourish as she wrote down the lyrics from their collection of 45 and 78 rpm recordings. “I started singing harmony with my mom,” she recollects. As noted, the divorce of her folks killed the band, freeing Suzette to take her music to L.A., the paradise city. Should note that Suzette, a foreign languages major at Trinity University – “I speak French, German and Spanish” – has used that knowledge while capturing audiences during summer tours in Europe. While the Neon Angel loves touring and entertaining, she always is glad to get back to her East Nashville apartment. “I still love Nashville,” she continues, adding some reservations: “The traffic is getting terrible and there are all those high rises and all the good, old buildings are getting torn down.” Damn right. “When I first moved to Nashville, East Nashville was kind of rough,” she says, of the section of town that has become one of the city’s most desirable neighborhoods, a place where young people aiming for success in the music business settle. She declares it a “youthful and lovely environment,” with not a trace of irony, since she defies the calendar and feels a part of that hip, youthful culture. Course she does play in East Nashville saloons, but she frequently crosses the Cumberland to perform at Robert’s Western World and other tourist-centric, neon-lighted joints on Lower Broadway, our own little Honky-Tonk Disney World. Like most Nashville singer-songwriters ignored by Music Row, she always carries copies of her album. 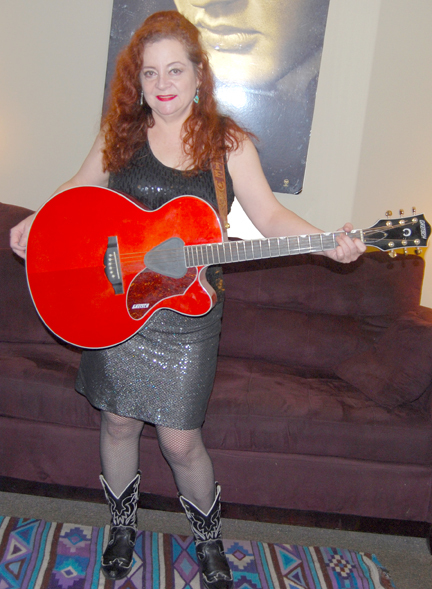 Her “Tear Up The Honky Tonk” is filled with lively rockabilly songs she has composed. This woman who loves to swing dance and two-step in her free time – “that’s my favorite exercise” – is always poised for action in case someone summons her and her Gretsch guitar into Nashville’s neon night. Nashville doesn’t have a lot of fairy-tale endings. That’s certainly demonstrated by Suzette’s ongoing struggles and the lack of the stardom she expected. “I was sad that things didn’t work out” long ago with Polygram, she says.